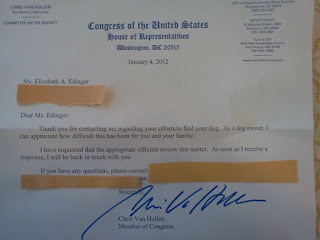 A little before winter break we asked our Congressmember Chris Van Hollen for assistance because we can't get answers from the multiple state and federal agencies involved*, primarily about placing cameras and traps. He's promised to look into it. * For example, to place a camera or trap in Chevy Chase circle, you need permission from the National Park Service (and they have not responded to our request)... but the local Chevy Chase Village police have offered to help (which is much appreciated). And to do something along the section of the Georgetown Branch trail we need to target (that cuts through Columbia Country Club), we get the runaround from Montgomery County. This is fantastic! He's a good man.